90 MINUTE LOBSTERING TOUR: Get up close and personal with lobsters. See how lobster traps are hauled. Put on gloves, help bait the traps, and sort the catch. Learn how lobsters live and how lobstermen catch them, while enjoying beautiful Newport Harbor! Join the fleet of working fishing boats in Newport Harbor and let’s go lobster fishing with Fish’n Tales Adventures. Head down to Bowen’s Wharf off America’s Cup Avenue, meet the captain and crew aboard the 50′ wooden lobster boat F/V Northeastern and motor out to some of the best lobster fishing grounds in New England. Sit back and watch how lobster traps are hauled up from the sea floor, then get to work, helping the crew sort the catch, throwing the small lobsters back into the sea, and re-baiting the traps. They’ll tell you all about what it’s like to be a working lobsterman on beautiful Narragansett Bay. This 90-minute marine adventure stays in protected waters, and the classic- Maine-built vessel is U.S.C.G. certified and comfortable for passengers. Wear soft-soled shoes only or rubber boots; no heels or hard leather boots on board. Dress for changing weather conditions in all seasons. Note: In an effort to preserve the future of the marine life, everything caught is released back into the sea. Welcome aboard! 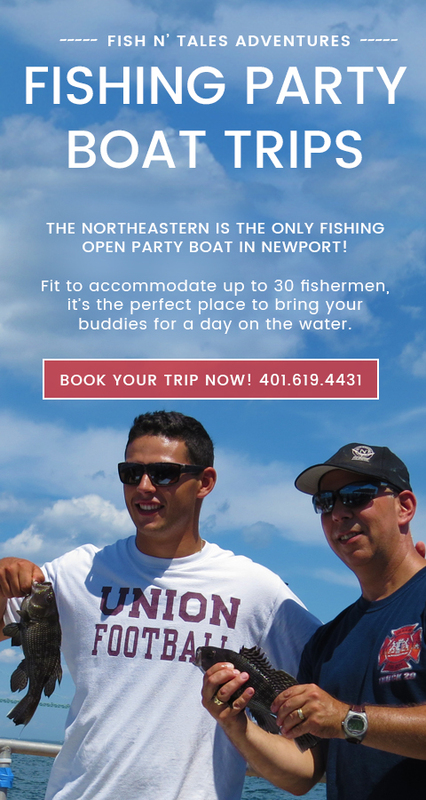 Join the Captain and Crew aboard the 50′ fishing vessel Northeastern on a memorable adventure in Narragansett Bay off Newport harbor. Choose either a Lobstering or Fishing Trip. Northeastern is located right next door to Aquidneck Lobster Company on Bowen’s Wharf.